COLOMBO, Sri Lanka — Sri Lankan officials failed to heed warnings from intelligence agencies about the threat of an attack by a domestic radical Muslim group that officials blame for Easter Sunday bombings that killed more than 200 people, the country’s health minister said Monday. The co-ordinated bombings that ripped through churches and luxury hotels were carried out by seven suicide bombers from a militant group named National Thowfeek Jamaath, Health Minister Rajitha Senaratne said. International intelligence agencies warned of the attacks several times starting April 4, Senaratne said. On April 9, the defence ministry wrote to the police chief with intelligence that included the group’s name, he said. On April 11, police wrote to the heads of security of the judiciary and diplomatic security division, Senaratne said. It was not immediately clear what action, if any, was taken in response. Authorities said little was known about the group except that its name had appeared in intelligence reports. Because of political dysfunction within the government, Seranatne said, Prime Minister Ranil Wickremesinghe and his Cabinet were kept in the dark about the intelligence until after the attacks. President Maithrela Sirisena, who was out of the country at the time of the attacks, ousted Wickremesinghe in late October and dissolved the Cabinet. The Supreme Court eventually reversed his actions, but the prime minister has not been allowed into meetings of the Security Council since October. All of the bombers were Sri Lankan citizens, but authorities suspect foreign links, Senaratne said. Earlier, Ariyananda Welianga, a government forensic crime investigator, said an analysis of the attackers’ body parts made clear that they were suicide bombers. He said most of the attacks were carried out by individual bombers, with two at Colombo’s Shangri-La Hotel. The bombings, Sri Lanka’s deadliest violence since a devastating civil war ended a decade ago on the island nation, killed at least 290 people with more than 500 wounded, Police spokesman Ruwan Gunasekara said Monday. Meanwhile, Sri Lankan police investigating the bombings are examining reports that intelligence agencies had warnings of possible attacks, officials said Monday. And Mano Ganeshan, the minister for national integration, said his ministry’s security officers had been warned by their division about the possibility that two suicide bombers would target politicians. The police’s Criminal Investigation Department, which is handling the investigation into the blasts, will look into those reports, Gunasekara said. “We placed our hands on our heads when we came to know that these deaths could have been avoided. Why this was not prevented?” he said. Earlier, Defence Minister Ruwan Wijewardena described the blasts as a terrorist attack by religious extremists, and police said 13 suspects had been arrested, though there was no immediate claim of responsibility. The Tamil Tigers, once a powerful rebel army known for its use of suicide bombers, was crushed by the government in 2009, and had little history of targeting Christians. While anti-Muslim bigotry has swept the island in recent years, fed by Buddhist nationalists, the island also has no history of violent Muslim militants. The country’s small Christian community has seen only scattered incidents of harassment in recent years. The explosions — mostly in or around Colombo, the capital — collapsed ceilings and blew out windows, killing worshippers and hotel guests in one scene after another of smoke, soot, blood, broken glass, screams and wailing alarms. 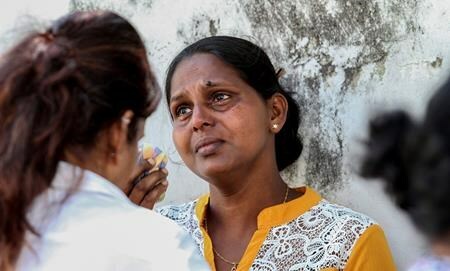 A morgue worker in the town of Negombo, outside Colombo, where St. Sebastian’s Church was targeted, said many bodies were hard to identify because of the extent of the injuries. He spoke on condition of anonymity. Lakmal, a 41-year-old businessman in Negombo who declined to provide his last name, went with his family to St. Sebastian’s for Easter Mass. He said they all escaped the blast unscathed, but he remains haunted by images of bodies being taken from the sanctuary and tossed into a truck. At the Shangri-La Hotel, a witness said “people were being dragged out” after the blast. The streets were largely deserted Monday morning, with most shops closed and a heavy deployment of soldiers and police. Stunned clergy and onlookers gathered at St. Anthony’s Shrine, looking past the soldiers to the stricken church. The Sri Lankan government initially lifted a curfew that had been imposed during the night but reinstated it Monday afternoon. 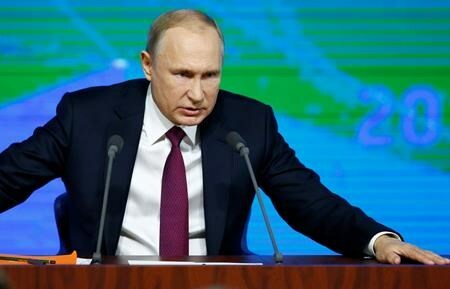 Most social media remained blocked Monday after officials said they needed to curtail the spread of false information and ease tension in the country of about 21 million people. Prime Minister Ranil Wickremesinghe said he feared the massacre could trigger instability in Sri Lanka, and he vowed to “vest all necessary powers with the defence forces” to take action against those responsible. The scale of the bloodshed recalled the worst days of Sri Lanka’s 26-year civil war, when the Tamil Tigers, from the ethnic Tamil minority, sought independence from the Sinhalese-dominated country. The Sinhalese are largely Buddhist. The Tamils are Hindu, Muslim and Christian. Sri Lanka, off the southern tip of India, is about 70 per cent Buddhist. In recent years, tensions have been running high between hard-line Buddhist monks and Muslims. Six nearly simultaneous blasts took place in the morning at the shrine and the Cinnamon Grand, Shangri-La and Kingsbury hotels in Colombo, as well as at two churches outside Colombo. A few hours later, two more blasts occurred just outside Colombo, one at a guesthouse where two people were killed, the other near an overpass, Atapattu said. Authorities said a large bomb had been found and defused late Sunday on an access road to the international airport. Air Force Group Captain Gihan Seneviratne said Monday that authorities found a pipe bomb filled with 50 kilograms (110 pounds) of explosives. It was large enough to have caused damage to a 400-meter (400-yard) radius, he said. Associated Press journalists Gemunu Amarasinghe in Negombo, Sri Lanka, Rishabh Jain in Colombo and Sheila Norman-Culp in London contributed to this report.